I think we’ve all felt the annoying sting of finding a gift card in our purse or wallet and not knowing the amount on it. For this reason alone, the Card Tracker was designed to help you manage each gift card you receive, either as a gift or more likely as a gift, haha. You can simply enter the information for each card you receive into this expanding Excel document and then look up the exact information you need when you need it. There’s not much else to it, other than building up your personal army of cards and spending it all in one day, at least that’s the dream. Learn more about this free template by reading the information below. You will need to download the template file directly to your computer by clicking the link at the bottom of this page first. Once you have the document you can go through the required pieces of information in the main table. You will want to have all your gift cards ready for this process. Take one from your pile or the first one you’ve received for the year and enter the date you got it. This is helpful in the case it has an expiration date. Next, enter the card number, in case you need to copy and paste it later on the company’s website to learn the current amount on it. You can list yourself as the recipient or the person you’ll be giving the gift card to, either way works fine. Now, list the amount it under the “Amount” column. You’ll then enter the expiration date and the date you redeemed the gift card in the final two columns of the table. The template takes the amounts and dates into consideration and then calculates the amount you have total for all cards, the amount you have redeemed thus far, and the difference between these two figures. 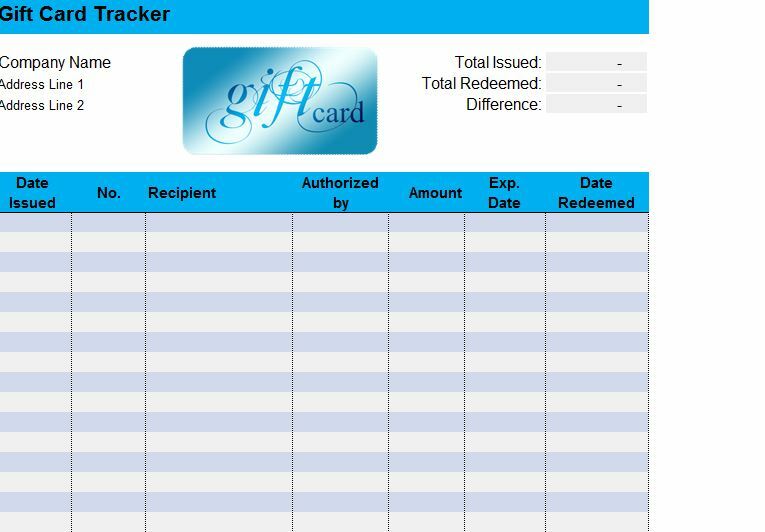 Tracking your cards is a breeze with the Gift Card Tracker!